Word Hero sounds familiar doesn’t it? I had bumped into the title here and there. 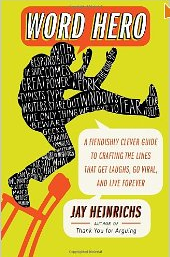 I finally picked up a copy when I realized it was by the same author as my recent favorite Thank You For Arguing – Jay Heinrichs. Turns out his title inspiration was Guitar Hero, and therein lies the secret to success. Timing is critical as we learned writing the book on Oracle and Open Source. But just as important is pithy, punchy prose. Word Hero takes you through chapter by chapter introducing you lightly to the wisdom of the ancient Greeks, but more importantly explains exactly how to get to these phrases that have a life of their own. If you’re a freelance blogger or sometime free agent, you should also take a look at Startup of You by Hoffman & Casnocha. I definitely like the way Heinrichs breaks down techniques & offers illustrates exactly how to give it all a try yourself. I tried it myself a bit with this blog post. What do you think? I also tried to put it to use in this review of Startup of You. I titled it Opportunity a day – career risk at bay. Kinda catchy I thought. Definitely grab a copy of Word Hero, it’ll help you with your blogging, sending a memorable email, or putting together presentations that resonate. Don’t forget to work on your Klout score!